The court garden of the Würzburg Residence is located on the edge of the baroque town fortifications with their massive supporting walls, which still border the palace complex to the east. At the end of the 18th century, the court gardener Johann Prokop Mayer (1735-1804) was instructed to lay out the Residence Court Garden. 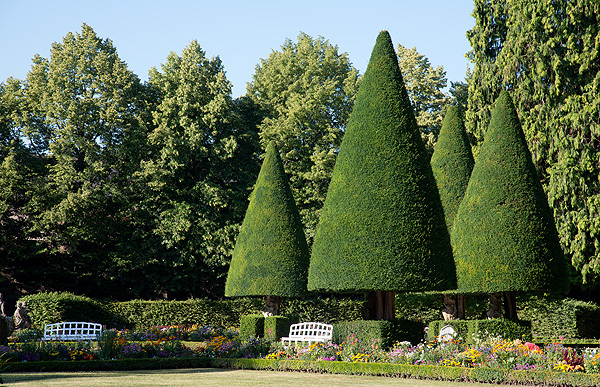 The land, which had an awkward shape and rose steeply towards the bastions, was skilfully divided by Mayer into individual, symmetrically arranged and self-contained garden areas. He created a typical rococo-style garden, filling the various sections with clipped fruit trees, tub plants, flower beds, hedges, spaliers and pergolas. 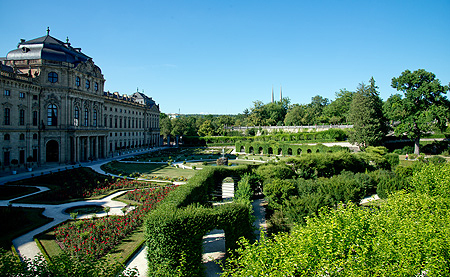 The east garden, which is an extension of the main axis of the palace, rises in three terraces to the tip of the bastion that marks its boundary. The rectangular south garden is by contrast entirely flat. It has a round pool at the centre with a large monolith made of tuff, above which is a small fountain which also operates in the winter months. For several years now, the flowerbeds framing the parterres of the east and south gardens have been planted in their original design, and in the reconstructed kitchen garden below the orangery are fruit trees clipped according to historic methods. On the town side, in front of the strictly geometrical garden sections, is a small landscape garden dating from the early 19th century. The neoclassical garden sculptures are copies of the originals made in the workshop of the court sculptor Johann Peter Wagner and the elaborate wrought-iron gates are from the workshop of the court locksmith and ornamental metal-worker Johann Georg Oegg. The reconstructed kitchen garden in the court gardens of the Würzburg Residence was reopened to the public in 2002. It was laid out in the original pattern of paths and beds and was planted with new and historic types of fruit and vegetable. bus to "Mainfranken Theater", tram to "Dom"